How one community organized, persisted and won a major political victory against all odds. 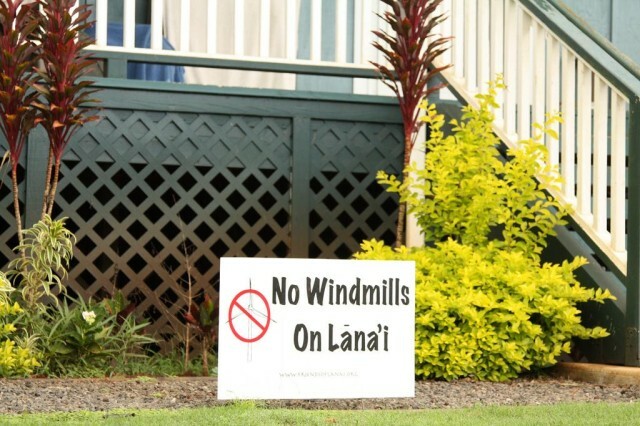 On Aug. 15, the Hawaii Public Utilities Commission officially pulled the plug on David Murdock’s environmentally disastrous plans for Big Wind on Lanai. 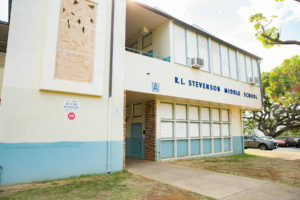 Citing the Legislature’s recent repeal of the 2012 undersea cable bill (Act 205), and HECO’s statement that it no longer needed wind from Lanai to reach its renewable energy targets, the PUC closed the door on the Murdock/Lingle/Abercrombie plan to sacrifice one-quarter of Lanai to enrich a mainland real estate developer’s bottom line. The PUC’s announcement brought back a flood of memories, some pleasant, some — not so much. 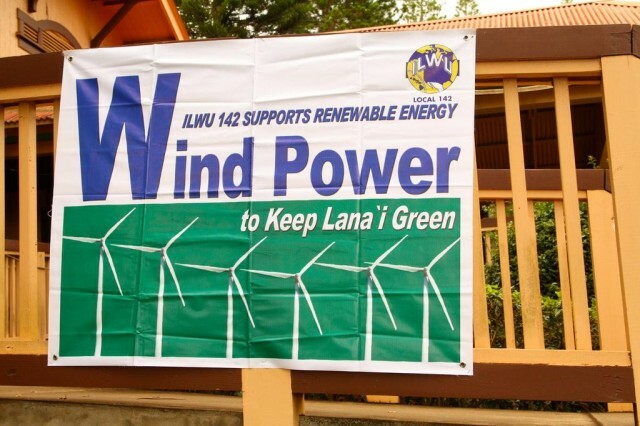 Friends of Lanai opposed wind farms on the island for years. The PUC has finally closed the books on the Big Wind project. 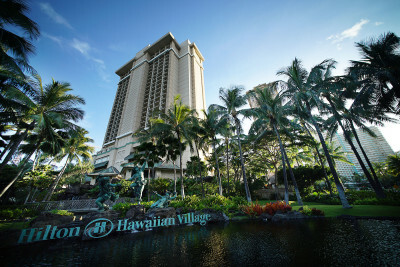 When Murdock took over in the late 1980s, he promised to keep pineapple under cultivation, but a few years into his reign, he decided there simply wasn’t enough water to support both the plantation, then the world’s largest, and the hotels and luxury homes he planned to build. Murdock was sure that visitors would stay in his hotels, fall in love with this beautiful, quiet island, and stay; he envisioned finally making a profit on his investment in Castle & Cooke. Unfortunately for Murdock’s wallet, this logic proved to be flawed. 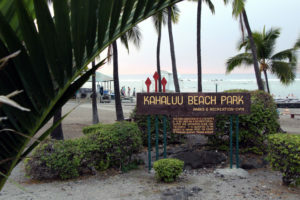 For one, his dream of residential luxury development was already years ahead on Maui; and perhaps even more so, the state economy faltered just when he needed it to support tourism’s growth on Lanai. Guests may have loved staying in his hotels at Manele Bay and Koele, but few made the transition to becoming residents — not even snowbirds. So he lost patience with tourism and cut a new deal with then Gov. 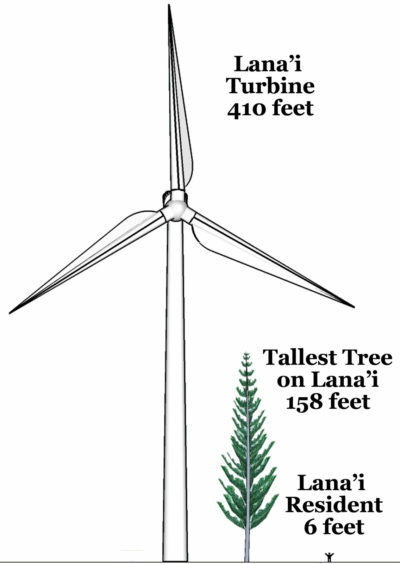 Linda Lingle: he would build a huge industrial wind power plant of 400 MW on what he considered “wasted” Lanai land, and ship it all to Oahu through an undersea cable that he would also build. 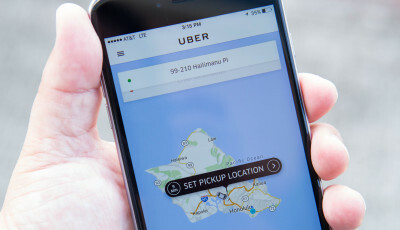 This package would provide electricity equal to almost one-third of Oahu’s power use at the time. It was a brilliant scam, providing him an annual gross upwards of a million dollars over a guaranteed 20-year run, not including federal tax credits and grants. 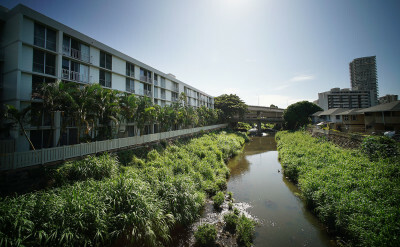 What a quick and easy fix to Oahu’s massive energy needs- just about everybody loved it — at first. Not everyone opposed Big Wind and the debate split the community. But Lingle and Murdock and later Gov. Neil Abercrombie made a fundamental and ultimately project-killing mistake. They completely underestimated (did they even consider?) the community’s opposition to losing its identity and more than 20,000 acres of land of significant cultural, historic and recreational value to 170 giant turbines. Murdock’s arrogance during this time was palpable: how could a plantation town not do what its feudal lord wanted? How could “his” people not get behind making him money? 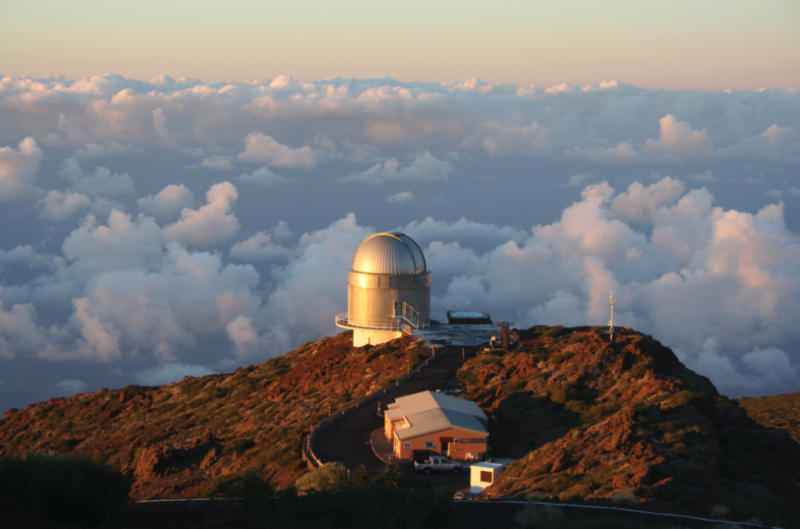 How could the state’s monopoly utility get the power it needed if not from Lanai’s unused (read: undeveloped) hills? How could powerful legislators and government officials not support this? And so, the battle was joined — at the dinner tables where brothers and sisters publicly disagreed with each other whether what was good for Murdock was good for the island; parents argued with their children, friends with friends. Looking back at this period, it’s clear that Big Wind’s biggest impact was to shred the social fabric of this small, rural island that had sustained it since the 1920s when the Dole Planation opened for business. There were key moments in the State Capitol’s square building: first a meeting in Gov. Abercrombie’s office with a contingent of Lanai residents who had formed Friends of Lanai to support each island’s energy independence and to oppose Big Wind (folks on Molokai, also an early target of Big Wind, formed their own group, I Aloha Molokai). 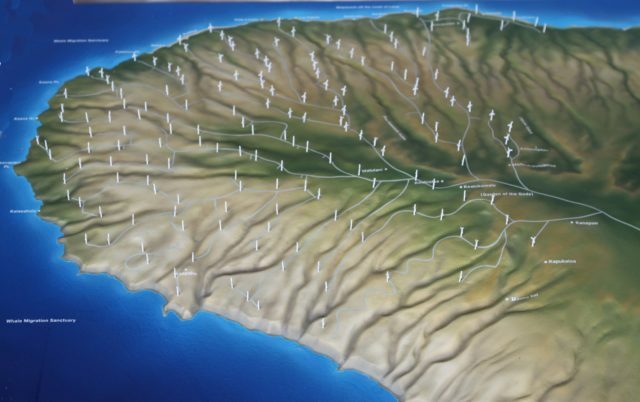 This model put together by Friends of Lanai shows where about 170 wind turbines would have been located on the island. And there were key victories here on Lanai: A bank manager unexpectedly walking away from the bank to join our sign-waving group. People coming up to me at the post office, looking both ways to see who was watching, then giving me a contribution for FOL. The individual whose generosity allowed us to engage the state’s best environmental attorney. The local lawyer whose research and writing skills gave Murdock’s attorneys a serious challenge. 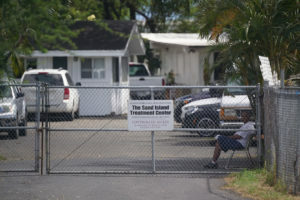 The residents who took days off from work to travel to every other island for PUC public hearings. There’s the young Hawaiian woman who offered to beat up the guy who threatened my family. The long-time resident who came up to me at the hardware store and told me that he couldn’t come out publicly, but he was honored that FOL was speaking for him; the many Oahu environmentalists and ex-legislators who helped guide us through the environmental and legislative review process, and the many, many Oahu folks who housed and fed us when we came over to testify. There were hundreds of hunters who signed the “No Windmills on Lanai” petition; generous contributions from supporters that paid for our videos and the incredible model of the wind power plant. How we relished the stunned look on federal officials’ faces when they saw what Murdock really had in mind. On the other side, we had the local ILWU cheering on Murdock, thereby turning its back to its heroic history of working on behalf of its workers, not the Company. The local leadership of the ILWU caved to the Maui leadership and let them tell Lanai workers what to do and how to think. We fought with the editor and owner of the local newspaper which steadfastly refused to accept any anti-wind, anti–Murdock articles, letters or even paid-for ads. And then there was one Oahu tech advocate, a staunch supporter of all things that reeked of corporate development, and a huge Murdock fan. That writer was so wrong in so many ways, but in one instance he was correct: it wasn’t a fair fight at all. 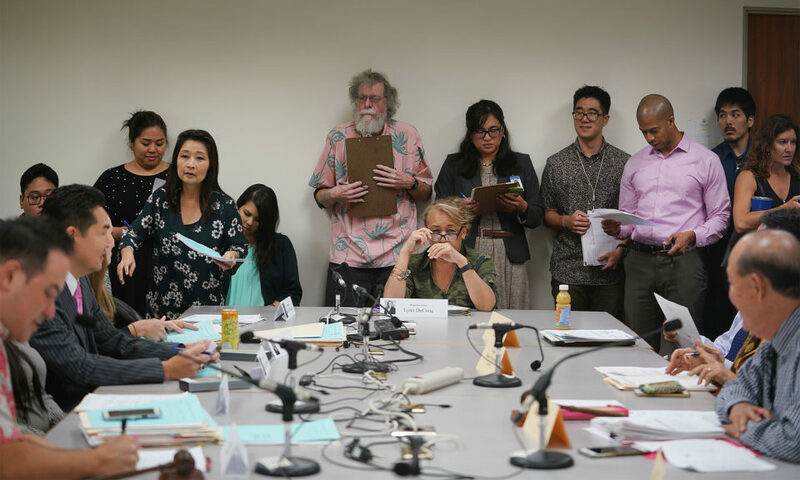 Given the power of the Governor’s Office, the largely apathetic Legislature, a complicit and compliant PUC chair (appointed by Lingle), and Murdock’s total control over 98 percent of our island, we should not have won. 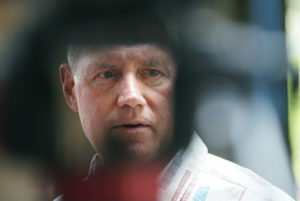 Then-Gov. 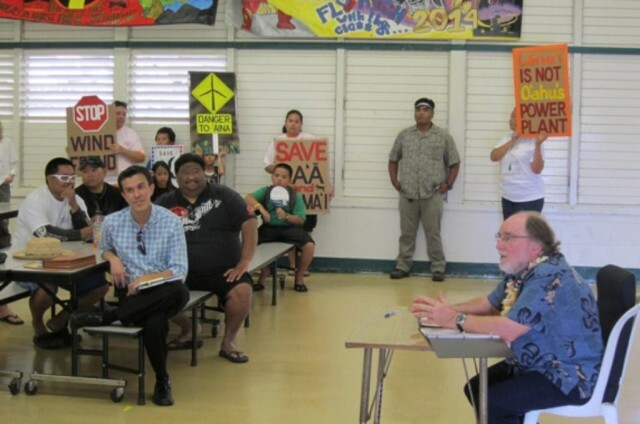 Neil Abercrombie visited Lanai and met with residents to talk about why he thought the wind farm project was important. But we did. We learned how to organize, how to make our collective voices heard; we never gave up, and we stayed strong in the face of overwhelming odds. 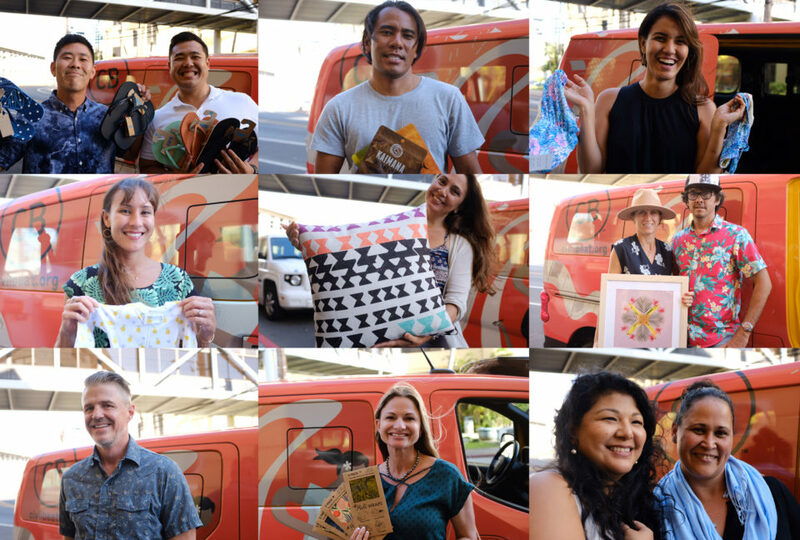 As a result, we can now say sayonara to Big Wind. 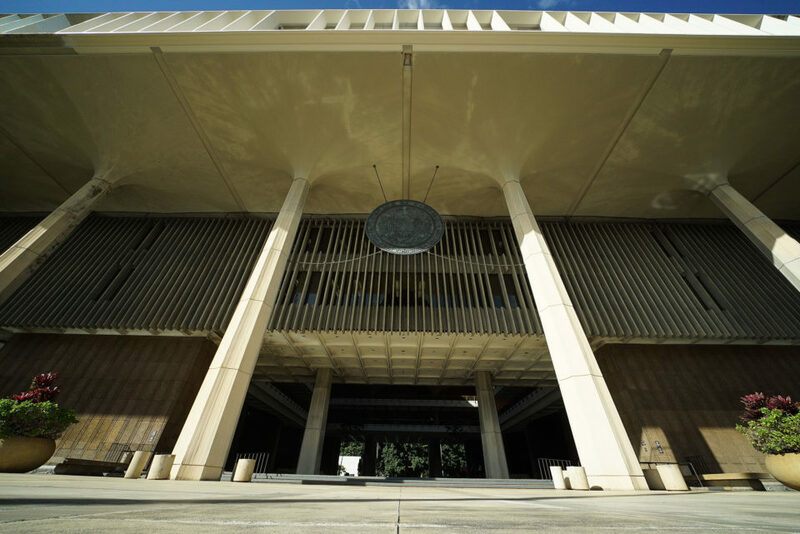 I knew then we had won, but it took several more years for the Legislature, HECO and the PUC to get the memo. The PUC’s action on Aug. 15 almost feels anti-climactic. But we welcome it all the same. We persisted, we yelled, we wrote, we testified, we told the truth — and we won. 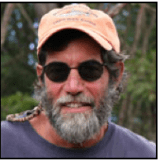 Robin Kaye is a longtime Lanai resident and energy activist and chairman of the Friends of Lanai. He is the author of Lanai Folks.